Orla began attending yoga classes in the 90s and quickly discovered the benefits of a regular practice. She practiced Iyengar yoga for 3 years under the guidance of Orla Punch. This helped her a lot in the early stages of her practice where she learnt a lot about the use of props and correct alignment. When she moved to Wicklow, Orla discovered Liz Richards and The Ananta Yoga Studios, which had just opened. She quickly became a regular and dedicated student of Liz’s Vinyasa classes which opened up a fresh and new perspective on her already well estblished practice. The physical benefits of a regular Vinyasa practice soon had a profound overall effect. Having suffered from chronic hip pain for many years, Orla was free from pain, stronger, with greatly improved flexibility and energy. The benefits did not stop there. Beyond the realms of the physical body, Orla found a greater sense of overall calm with a regular practice – a sense of positivity and a greater ability to deal with lifes challenges. In 2013 she began a 200 hour Yoga Alliance Certified Teacher Training Programme under the guidance of David Curtis of Vinyasa Yoga Dublin at The Ananta Yoga Studio. The training was spread out over a two and a half year period to ensure the highest standards of practice and teaching were attained by the participants – beginning with establishing a disciplined and daily home practice from which teaching skills began to organically unfold as the training progressed. Orla found this process at times very challenging yet hugely rewarding and she completed the training in 2016. She continues to attend regular classes and workshops with both David Curtis and Liz Richards at The Ananta Yoga Studios. 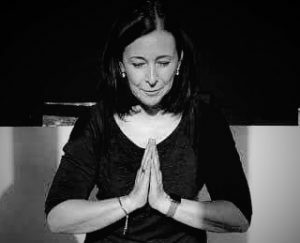 Orla is very grateful to Liz Richards and David Curtis for their guidance and support and is looking forward to teaching Beginners Vinyasa Yoga classes at The Ananta Yoga Studios from March 2017.